for £22 postage paid World-wide. A number of things mark out this Music Concepts set in a hideously thronged field. The first is the controversial Welsh conductor, Wyn Morris. 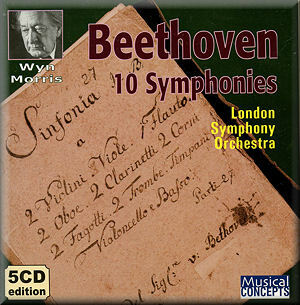 The second is that this set includes the Barry Cooper completion of the Beethoven Tenth. This is the first time the cycle has been issued in a single box. To be welcomed is that the return of these recordings by John Boyden (producer) and Trygg Tryggvason (engineer) is at super bargain price. Most but not all of them were first issued by IMP but they never had much of a profile. I first encountered Morris as the conductor of Isabella Wallich’s Symphonica of London specially assembled to record a bargain double LP set of Mahler 8. With its gatefold and low entry price it had some of the éclat of the Hanae Nakajima Beethoven Fifth Piano Concerto LP famously available on wobble vinyl only from Woolworths. They went on to do Mahler 5 and 9 in the same price bracket. This at a time when Mahler was the domain of prohibitively full price CBS, Decca and Philips LPs. The Symphonica, I recall, had horn desks bristling with members of the Tuckwell family. Morris and Symphonica/IMP started a cycle of the Beethoven piano concertos with Charles Rosen but this seems never to have got beyond numbers 2 and 4 lauded and 5 not. First off this is a really well documented set. The notes are in English only and run to 24 pages. These offer discographical detailing though no recording location, track or work timings; anyone know where these were recorded and perhaps exact session dates? There are four pages of including music illustrations where Professor Cooper introduces his realisation of Beethoven 10 - the 'real' one not Brahms’ First. Wyn Morris is profiled, warts and all across six or so pages. It’s certainly not hagiography. His belligerence and arrogance coupled with his capacious taste for alcohol destroyed relationships with orchestra managements and left him in the cold for almost a decade until in 1984 John Boyden tried him out with the LSO for a Wagner selection. The old chemistry rekindled, came back on full stream and a group of London business magnates backed the present Beethoven cycle which was issued through Pickwick IMP and in the USA via MCA. The author of the profile is Gene Gaudette who also surveys the Beethoven symphonies over five pages. The German original sung text of the finale of the Choral Symphony plus a side by side translation is also given. This is traditional Golden Age stuff where Morris rejects HIP strictures and embraces red-blooded engagement in a way that may now make some blench. It’s full flavour, full-on Beethoven - potent, romping, athletic and not in a lean way either. The abrasive skirling attack of the brass in the Molto vivace of the Ninth is invigorating and exciting - nothing ascetic here. It's not all muscle either as the frictionless platinum lyricism of the great Ode to Joy theme in the Choral reports at 4:45 onwards. The quartet of voices are admirable though Gwynne Howell does show some strain. Their individual voices can easily be discerned rather than being lost in a general miasma. There’s no shortage of 'face' here. Shame about the misspelling of Alison Hargan's name on the box and insert. The London Symphony Chorus display impressive depth and unanimity. They gild the heavens with bullion in Elysian tones from tr. 8. It is good that the finale is in six tracks so one can cherry-pick. This a blazing performance with risks taken, as they say, with extreme prejudice. The Fourth is at times Haydn-like but roars and sprints in the third movement with its strongly predictive Brahmsian echoes. The Seventh has plenty of heft and gruffly spat-out stamina. There’s firebrand drive and spitfire attack in the finale. His Fifth blazes along, drenched in petrol and flaming forward, stately at times but responding well to the many ignition nodes. The brass in the third movement impress with their warlike blast and the finale maintains an iron grip - a shock-troop assault yet with the requisite torque to capture moments of repose and accelerate back into full frontal drama. Those imperious trumpets really reach out to the listener. The Eighth, which can have a Mozartean dancing divertimento feel to it, here majors on buffeting tempest rather than ingratiating cassation. The gentler moods are not rejected but Morris majors on shuddering exhilaration especially in the outer movements. Beethoven's ‘Tenth’ was begun before the Ninth and only the first movement reached any sort of completion. Otherwise Cooper and a colleague had to contend with about fifty very brief and tenuous sketches. Cooper's and Morris’s vision gives us a smoothly golden first movement of some elysian delicacy. The middle movement is tempestuous in the manner of the gritty explosions of the Choral. The final Andante offers symmetry with more of the godlike smiles of the first movement. It ends with descent into a warm cadence and then a full Beethovenian stop. It's a very incely proportioned piece of music which you should hear - whether it has sufficient of Beethoven's wildness I doubt. The accent is more Pastoral than Fifth. The Second Symphony is allowed to gruff and growl (III) as well as charm and serenade in the warmly decorated realms of the second movement. The finale has plenty of stamina and proceeds at a typically Morrisian lightning pelt. The Sixth is somewhat akin in mood. Broadly the even numbered symphonies are more contented than the odd numbered ones which lean on drama and heroism. The Andante and the Allegretto are as serene as I have heard them though this does not mean slow. After a magnificently focused, fleet-footed and dramatic First Symphony comes the Eroica. The booklet reminds us that this is not Morris's only seventh - I wonder how the two compare. He first recorded the work on LP (never since reissued on CD) in 1977 with the same Symphonica of London with which he had recorded the Mahler 8. The present reading is not lacking in whiplash resilience and fast fury nor in the Marcia Funebre in epic gravitas. Nervy energy and brusque magnificence is to the fore in the Scherzo. Now I hanker for a Wyn Morris Brahms Third and Fourth but it’s not going to happen. I recall how lacklustre were the Karajan LP box of the nine symphonies issued in 1977. They left and leave me completely unmoved - despite the god-like full page poses complete with apollonian expression and that shock of silvery hair. They compared very unfavourably with the old Decca cycle by Hans Schmidt-Isserstedt which I recall resounding around the house when my father was playing those Decca LPs in the 1960s. Mind you, I also enjoy the Beethoven piano concertos played by Friedrich Gulda also issued by Decca in a single box back in the 1990s and more recently appearing on Brilliant Classics. A digital cycle with old fashioned values and a certain intemperate freshness of approach - be prepared to rediscover Beethoven. Coupled with a lecture on the work by Barry Cooper.